The annual NatWest WISE100 recognises the most inspiring and influential women in social enterprise, impact investment and mission-driven business. Who's on this year's list? The names of the UK’s 100 leading women in social enterprise and impact investment were revealed last night, as attendees celebrated female leadership and explored the theme of ‘sharing the stage’ to involve more women in the impact economy. Names were selected this year from hundreds of nominations submitted by the public, with the final list of 100 revealed at last night’s event at Coutts on The Strand, central London, attended by over 200 women and their allies. In the spirit of ‘sharing the stage’, the list this year featured only first-time nominees, with an additional list published that recognised the 19 women who were nominated for two years running. The judges this year were: Megan Peat, CEO, RBS Social & Community Capital; June O’Sullivan MBE, CEO of London Early Years Foundation; Jessica Brown, Connect Fund Manager, Barrow Cadbury Trust; Claire Dove OBE, CEO of Blackburne House and Crown Representative of the Voluntary, Community and Social Enterprise sector; Abbie Rumbold, Partner at Bates Wells Braithwaite; and Amy Clarke, Partner & Co-Founder of Tribe Impact Capital. During a panel discussion, speakers explored ways to create space for more women to drive the impact economy. Panellists spoke about the responsibility of female leaders to help less experienced colleagues and peers, the importance of role models, and the need to create a more diverse social enterprise sector for the future. Speaker Sarah Weir, CEO at the Design Council, took the evening's theme of sharing the stage literally, inviting three young attendees to join her on the stage: those who've stood before an audience, she said, are 30% more likely to put themselves forward for future speaking opportunities. "If we want to make an impact, if we want to be noticed, we have to be present," she said. Dr Pragya Agarwal, CEO at the Art Tiffin, widened the definition of diversity beyond gender. Sharing her own experience as a social entrepreneur, she added that social enterprise risks being seen "as a white, middle-class thing… If we want more BAME women involved we need to make them aware of what social enterprise does, and understand the context they’re coming from so we can support them fully". Panellists pointed out that over 40% of UK social enterprises are led by women, and that the gender pay gap is smaller than in the commercial sector – but called for us to aim higher still. "As a sector, we can be more ambitious about the scale of businesses we want to be running, and the scale of impact we want to be having," said Katherine Hibbert, Director at Dot Dot Dot Property. As well as putting on the annual event and celebration, NatWest has also been hosting regional WISE100 dinners, while Pioneers Post has been producing regular articles, films and podcasts on women’s leadership. 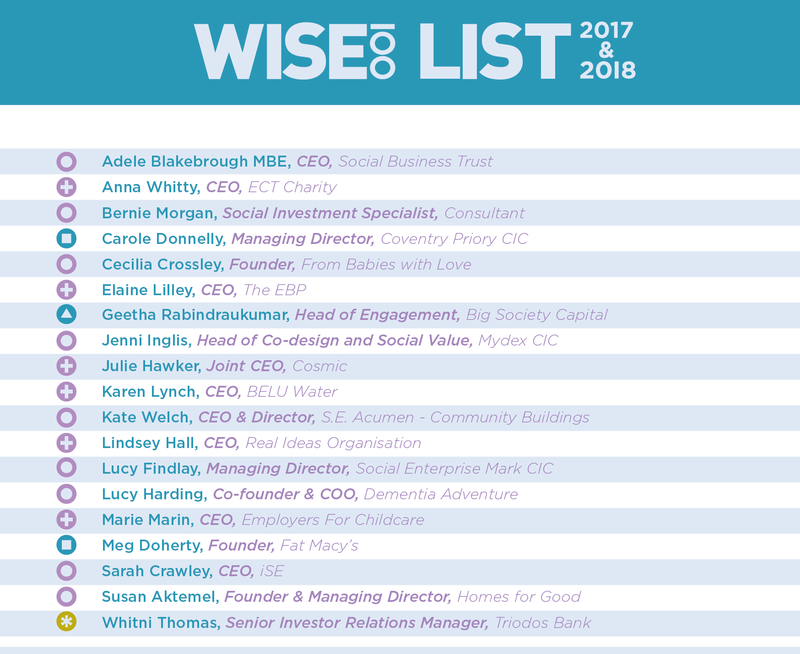 WISE100 2018: Who made the list? Judges considered entries in six categories, and selected two particularly influential and inspiring women in each one. Esther Foreman tells us her views on the tampon tax, and why she wishes she had never listened to some of the advice given to her growing up.